Due to the exposed ''tanim-bala'' scheme and the increasing number of victims, Civil Aviation Authority of the Philippines (CAAP) had relased a list of tips for the passengers to avoid being victimized. 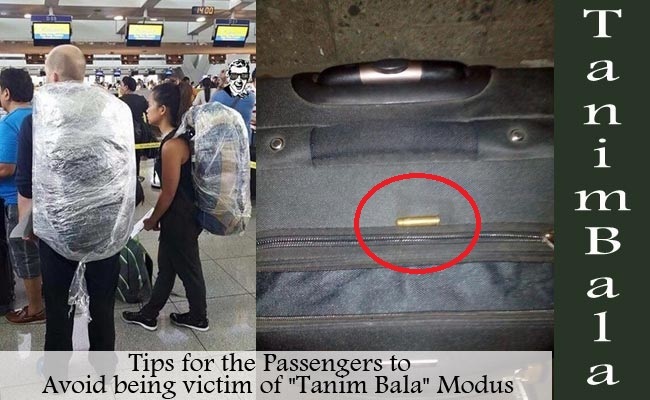 ''Tanim-bala'' scheme is an alleged syndicate modus operandi where a spotter will swiftly drop a bullet or two in a victim’s bag in the airport. The security checker will then pretend to spot the bullet and threaten the passenger who will have no choice but shed money to avoid the hassle. CAAP spokesperson Eric Apolonio adviced the passengers to be vigilant and strictly monitor their luggage. He said that the bags’openings such as the pockets, zippers and pouches must be closed, sealed and locked if possible so they will know ig their bags has been forcibly opened. Do not be lenient when your bags go through security x-ray and the metal detectors. You must never lose sight of your bags ad immediately retrieve them when you exit. Do not accept anything from strangers. CAAP will now require the airport security personnel's of Office for Transportation Security (OTS) to wear white gloves for sanitation purposes and to avoid those who will try to sneak something in the passenger’s bags. Furthermore, CAAP had allotted more funds for upgraded and additional cameras to all of the airports it is managing. As of date, CAAP is managing 84 airports, half of which are catering commercial flights. On the other hand, Undersecretary Roland Recomono said that there was no evidence that an airport personnel is involved in the said scheme. He said that there had been only two reported incidents and some had been speculating that a syndicate is behind the alleged scheme. He said that there is still no clear evidence that there is indeed a syndicate. There is no footage to prove the allegation. Recomono said that the incident could have even happened outside the airport and it would make it outside his jurisdiction. There is even no evidence that bullets were planted as there was no footage to prove it such as the cases of Rhed Austria de Guzman and American missionary Lane Michael White. De Guzman shared her story in Facebook which spark public outrage, especially from the OFWs who frequently uses the services of the Ninoy Aquino International Airport.